Xiaomi has just announced two smartphones that offer a pure Android experience with Android One. 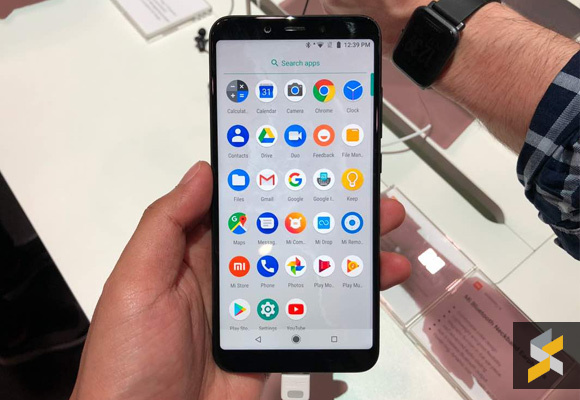 Following the success of its Mi A1, the new Mi A2 offers significant upgrades while the Mi A2 Lite brings great mid-range performance in an entry-level package. 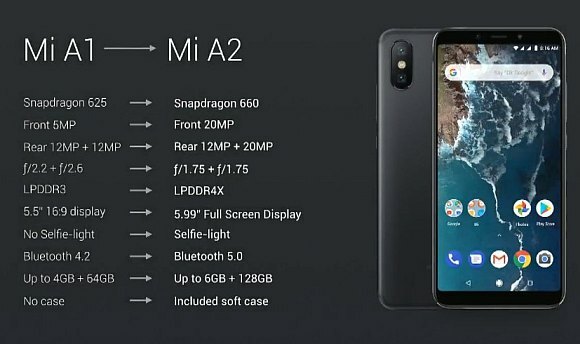 The Mi A2 is the currently the best Xiaomi device that runs on stock Android. It gets a 5.99″ Full HD+ display in an 18:9 aspect ratio and it’s protected by Gorilla Glass 5. Similar to the Mi 6X that its based on, it gets a more powerful Snapdragon 660 processor that’s mated with up to 6GB of LPDDR4X RAM. 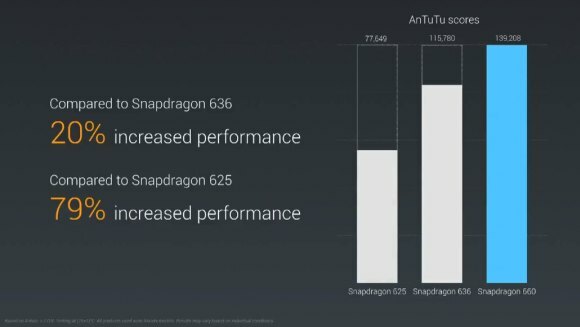 According to Xiaomi, it offers 20% better performance than the Snapdragon 636 processor that’s powering the Redmi Note 5 and 79% better performance than the Snapdragon 625 which is running on the previous Mi A1. 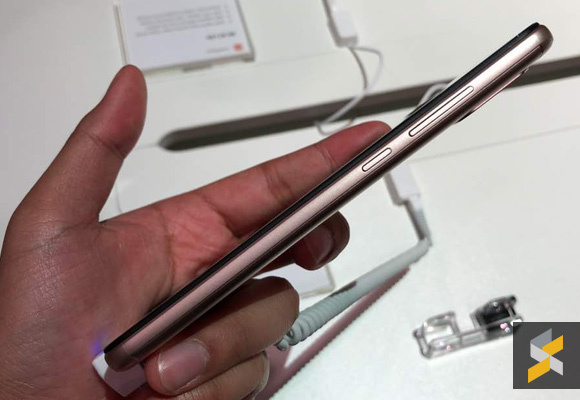 In terms of design, it looks more slender with an aluminium unibody design that features an arc back. The Mi A2 is only 7.3mm thin and it’s available in 3 colours – Black, Gold and Blue. 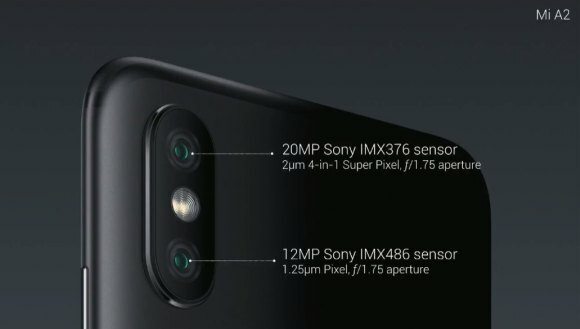 In terms of optics, it gets a 12MP (Sony IMX486) main camera and a 20MP f/1.75 (Sony IMX376) f/1.75 secondary shooter. 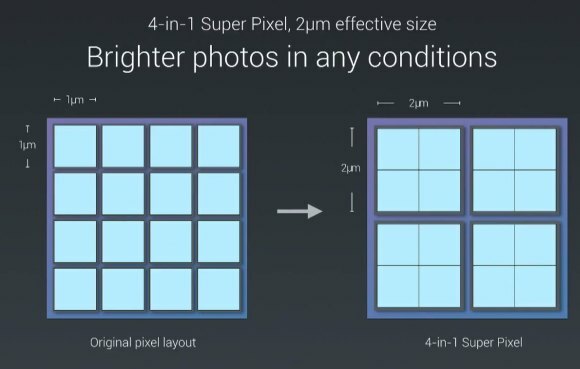 For better low light performance, the Mi A2’s camera has a larger 1.25-micron pixel size and it also supports pixel binning which combines 4 nearby pixels into a larger superpixel. As a result, you’ll get an effective 2-micron pixel size which captures brighter photos. The Mi A2 is also big on selfies with a 20MP front camera that also supports pixel binning. It also has AI-powered beautification and portrait mode as well as a selfie-light for low-light illumination. Powering the Mi A2 is a modest 3,010mAh battery which supports Quick Charge 3.0 via USB-C. However, Xiaomi is only bundling a standard 5V 2A power brick in the box. There’s a rear-mounted fingerprint sensor but it lacks a headphone jack. 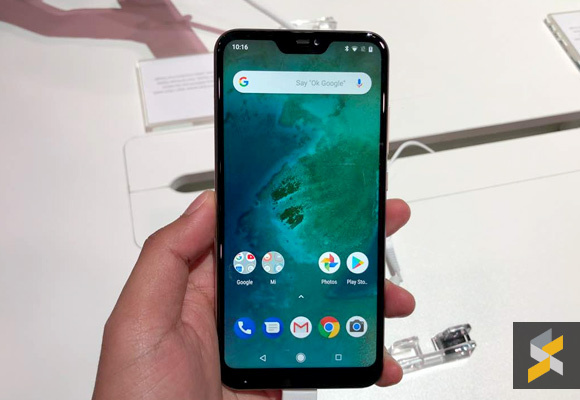 Out of the box, it runs on Android 8.1 Oreo and it will be one of the first smartphones to receive the upcoming Android P.
Do note that European pricing is higher than Malaysia, so expect it to be priced lower when it hits our shores. 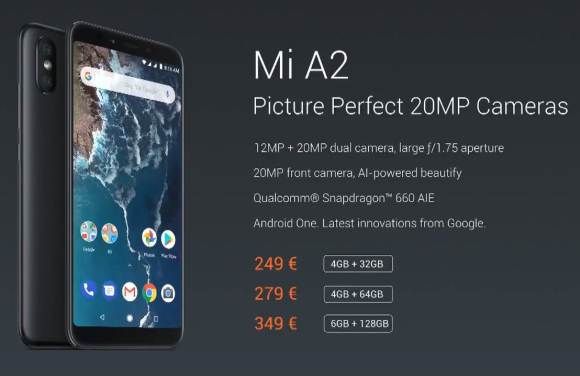 For those who wish to get a taste of Android One at a lower price point, they have also announced the Mi A2 Lite which is based on the Redmi 6 Pro. 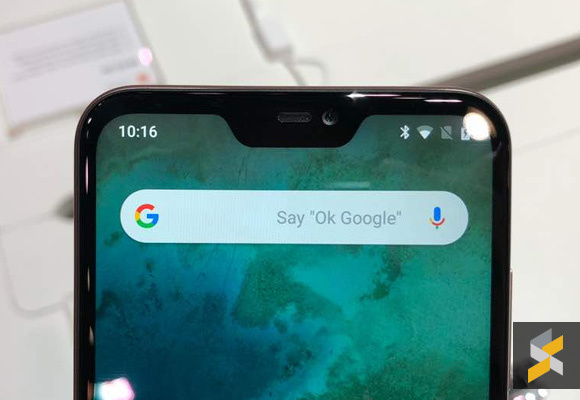 It features a 5.84″ Full HD+ display which comes with a notch and it has an aspect ratio of 19:9. Powering the device is a familiar Snapdragon 625 processor which is the same unit that’s powering last year’s Mi A1. 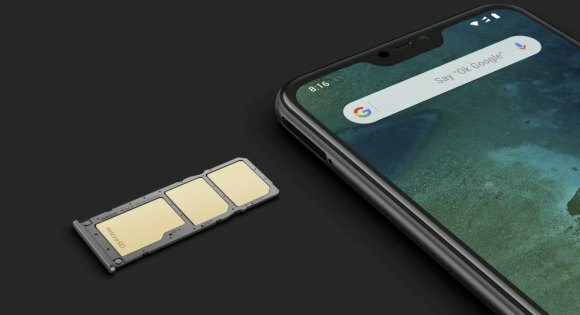 Xiaomi says it’s a first for an “entry-level” smartphone and it’s still more powerful than other mid-range processors. It comes with either 3GB or 4GB of RAM and has up to 64GB of storage. 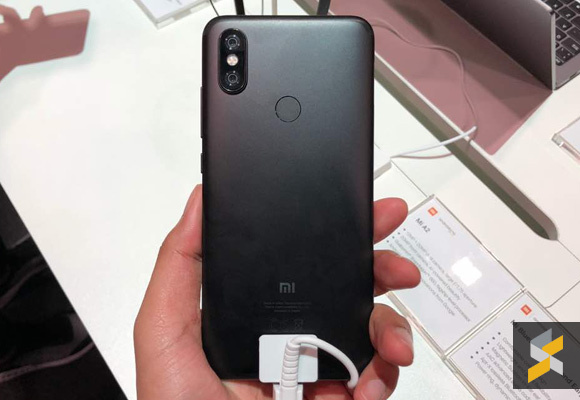 In the camera department, the Mi A2 Lite gets a 12MP main camera with PDAF that’s accompanied by a 5MP secondary shooter. Meanwhile, the front comes with a modest 5MP selfie camera that supports AI portrait mode. 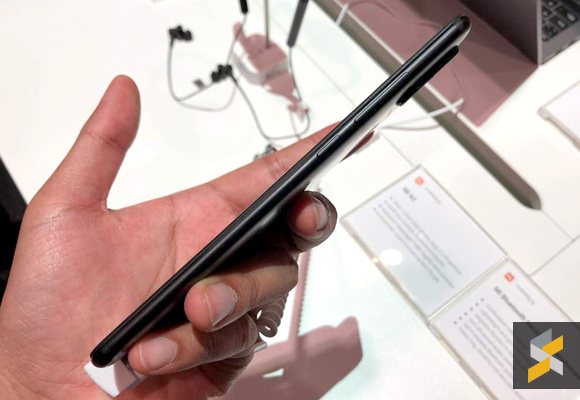 Despite being the cheaper model, it still gets a rear-mounted fingerprint sensor and a large 4,000mAh battery which is rated to last up to 2 days of use. 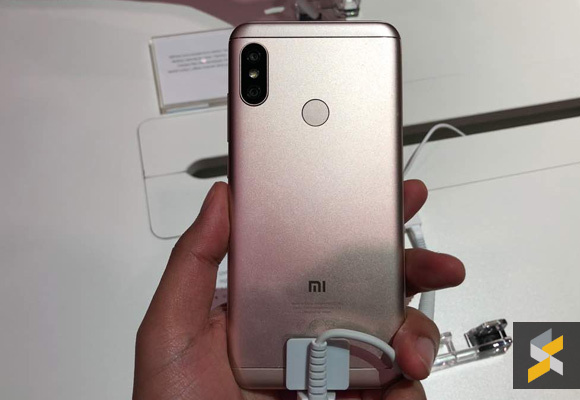 Unlike the Mi A2, the lite model charges via microUSB. It also comes in three colour options – Black, Gold and Blue. The Mi A2 and Mi A2 Lite will be rolled out globally starting late July and we expect both models to launch in Malaysia very soon. In the mean time, do check out our Mi A2 hands-on and first impressions.